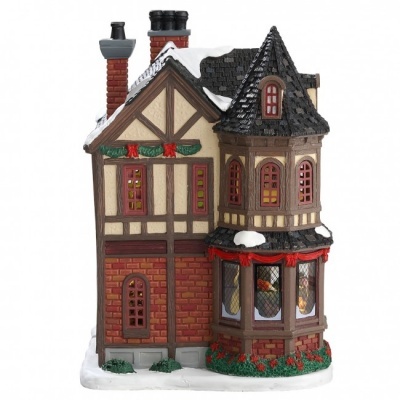 Lemax Scrooges Manor sights & sounds table piece depicts the snow draped stately home of Ebeneezer Scrooge at Christmas time. Scrooges famous manor house from the Dickens novel 'A Christmas Carol' is brought to life in this delightful Lemax Miniature table piece, with authentic vocal soundtrack and LED lit internal window scenes. Vocal soundtrack is accompanied by changing lights in window scenes, each illuminated to relevant scenes of the story teller. 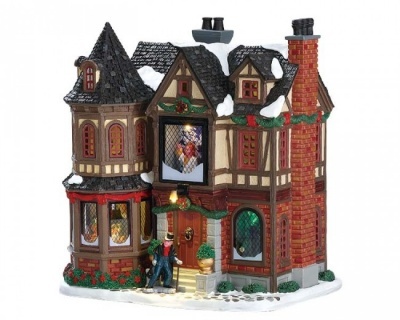 A mains powered illuminated and musical building suitable for placement in and amongst a seasonal Lemax village Christmas scene. A unique Lemax Caddington Village collectable table piece which joined the Lemax collection in 2018. 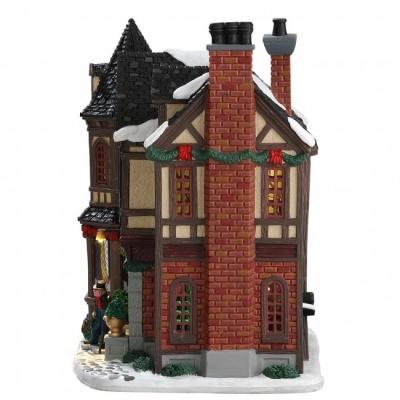 Scrooges Manor offers a delightful self standing polyresin (& plastic) building on an individual base to compliment your seasonal Lemax Christmas Village.